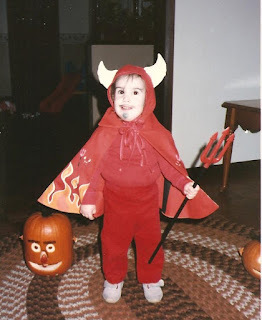 I use to recycle my children's Halloween costumes. I was green before it became fashionable! Here are my two little devils, Kirsten and Travis. Kirsten, 1985, age 22 months. My grandfather, Harry Glover, was married to Emma Winkler before he married my grandmother, Sarah Lilla Watt. Harry and Emma were married a short four years. 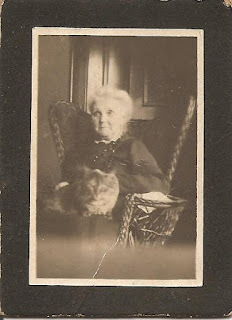 Emma Winkler Glover passed away 27 September 1915 in Detroit, Wayne, Michigan. Below is the obituary for Emma Winkler Glover. Mrs. Harry Glover of Detroit, formerly Miss Emma Winkler, passed away Monday evening at Detroit. Some ten days ago she gave birth to an infant who, with her husband, survives her. Mrs. Glover, who went to Detroit about a year and a half ago, was married four years ago. The remains will be brought to Marquette, arriving this afternoon and will be taken to the home of Mrs. Glover's sister, Mrs. Anna Shoemacher, West Ridge Street. Other sisters are Mrs. Conrad Wellman, of this city and Mrs. Asa Fellows, of Calumet. There are two brothers, Herman of Duluth and Ernest, of Chicago. Week 44: Elementary School. Describe your grammar/elementary school (or schools). Were they big or small? Are any of these schools still in existence today? If so, how have they changed since you went there? I entered the brown door on the right in the picture above in the fall of 1962 and started Kindergarten. 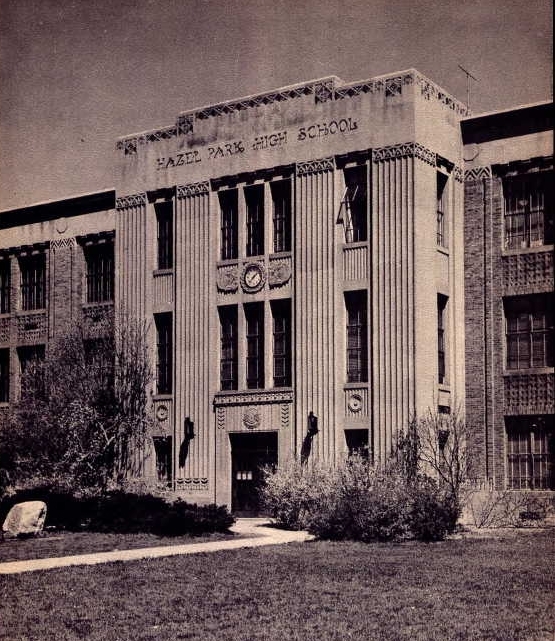 I attended this school until the end of the first semester of fifth grade in 1968. The picture above shows the wing the Kindergarten and 1st grade classrooms were in. It was a small school then and is still considered small. There were two kindergarten classrooms and two 1st grade rooms in this wing. It was detached from the rest of the school when I went there. There was an old two story school to the right and in front of this wing. They eventually tore it down and built more classrooms and connected it altogether. I never had any classes in the old school, but I remember my sister had girl scouts in the cafeteria of that building. For 5th grade I attended class in the new addition. It was a nice classroom. Again, the blackboard was to the right of the door. Two cupboards and hooks and shelves for coats were to the left. The back wall had a sink and drinking fountain on it. A window was in the back corner. Bulletin boards were across from the door. This is also the classroom that 12 years later, the man who would become my husband was teaching in. Today, the school is basically the same. A few years ago they added another wing to the elementary. It is behind and parallel to the wing in the picture above. My family moved 25 miles north to Harbor Beach, Michigan in January of 1968. I attended one semester of fifth grade and then sixth grade in Harbor Beach Elementary School. 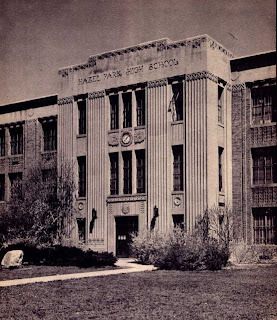 The elementary school was on the south side of the building that housed all K-12 grades. It was a little bigger than Deckerville, but still considered a small school. The classrooms were very similar to other elementary classrooms with chalkboards, bulletin board, hooks for coats, desks and cupboards. This school is the one that changed the most through the years. The district eventually built a separate elementary school and the wing I had gone to in 5th and 6th grade was the science and math wing in high school. The district also built onto the school sometime in the early 70's. They have recently built onto the high school again. The building is once again a K-12 school. I haven't been in the high school since 1981, when I interviewed for a teaching job. Week 42. Favorite School Subject. What was your favorite subject in school and why? Was it also your best subject? Although I haven't always done well in all my science classes, there is one science area that I loved and that was Anatomy. It was called Advanced Biology in high school. The teacher Mr. Clark made the class fun. We studied the systems of the human body for an entire semester. I find the study of the human body to be fascinating. I think my good memory helped in this class. I remember having to name bones, muscles, heart chambers, veins, arteries, etc. I took Human Biology in college and enjoyed that class as well. My Advanced Biology grade was mostly "A's". My Human Biology grade was a "B". Week 43. Worst School Subject. What was your worst or least favorite subject in school and why? As much as I liked anatomy, I detested Chemistry. Why I thought I wanted to major in medical technology when I went to college I have no idea. It was the thought of eight semesters of Chemistry that made me quickly change my mind. Plus, I failed one Chemistry class my second semester in college. I took one Chemistry class in high school and although I did well, A's and B's, it wasn't my favorite subject. I really liked the teacher, Mr. Miljour. He made the class fun, but I felt like I didn't have a clue in some of the labs we did. Even though I picked both subjects as science classes, it is the difference the teachers made in my life that made both experiences a good one. When I became a teacher myself, I remembered the teachers that made a difference in my life and tried to emulate them. Although, I never jumped on top of my desk to get my student's attention (Mr. Miljour did! 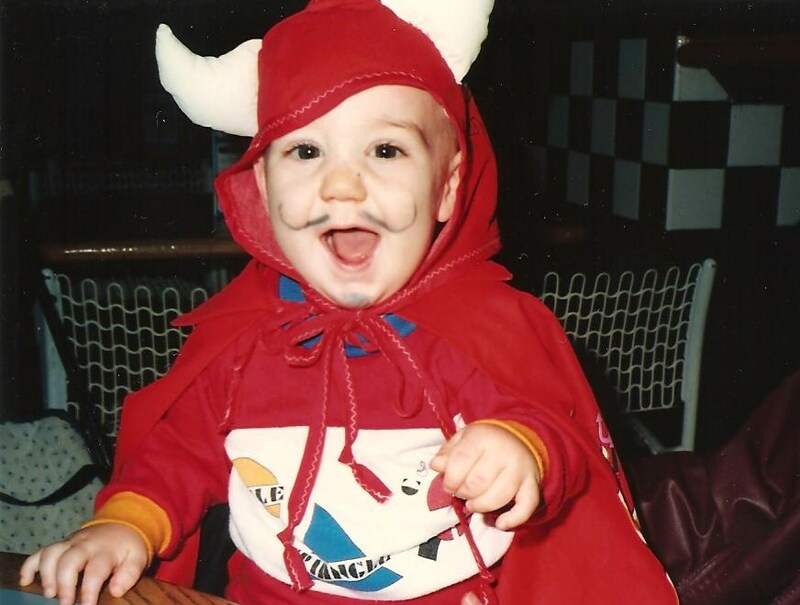 ), I did use humor in the classroom. Thank you Mr. Clark and Mr. Miljour for two great science experiences. I like to think that my Grandpa Glover is looking over my shoulder and chuckling at the challenge he has provided me in researching him. My dad knew him as Harry Glover, but thought his given name was Frank H. Glover, Jr. The first record I found for him was his World War I draft registration, it was Frank H. Glover, Jr. Recently, I found three obituary/death notices for my grandfather and a new name was found, Francis Henry Glover. I wonder if my grandfather had an identity crisis. For the record, his birth name was Harry Glover. He was the first son of Frank H. Glover. Hence, the Frank H. Glover, Jr. I have never seen another name for his father. It is consistently Frank H. Glover. I suppose Frank could be short for Francis and the H could be Henry, but I have never seen a source that substantiates that. My dad told me that his mother had a difficult time when Harry died. She always thought his given name was Frank H. Glover, Jr. Can you imagine the trouble she went through trying to get everything in order after his death? Services will be held at 2 Friday afternoon in the Swanson funeral home with the Rev. Homer Mitchell, pastor of the First Presbyterian church, officiating. Burial will be made in Park Cemetery. How great is a trip to the Library of Michigan? It exceeded my expectations! Where else could I spend a day and find obituaries from Marquette in the Upper Penisula, Manistee in Northwest Michigan and Royal Oak in Southeast Michigan? It would require hundreds of miles of travel. I found newspapers from all three of these cities at the library, which is 50 miles from my home. I started my day by arriving to the library at opening time-10:00 a.m. I headed straight to the newspaper room. This is a nice large room with microfilm readers on one side, microfilm scanner/printers on another and hundreds of microfilm rolls from 83 Michigan counties and other large cities. My goal for the day was to search from my list of obituaries, marriages and 50th wedding anniversary articles. I had eight articles I wanted to find from The Mining Journal in Marquette, Michigan. I started there first. I pulled four films and went to the microfilm reader to start looking. (They prefer you find it first on the reader and then take it to the scanner/printer. There is a 10 minute limit on the scanner/printers. Although, there were two people who used them the entire time I was there. I am a rule follower, what can I say!) I found four of the obituaries I was looking for. Next, I printed those off. You have the option of saving to a flash drive, there is one scanner for this purpose. I continued this way for a couple of hours. I decided to give my eyes a break and headed to the book section. I looked up information from Lenawee, Washtenaw, and Marquette counties. I was able to find what I was looking for quite easily. I went back to the Newspaper room and spent another couple of hours finding the rest of my articles. I used information from the printed books, that pinpointed exact dates, to complete my newspaper research. By this time it was three o'clock and I wanted to do a couple of look ups at the Archives of Michigan. They are open Monday to Friday, 1-5 p.m. You walk out the library door and go around a big tree and into another door and the archives are on the left. Talk about a different world. I had to sign in and show my driver's license. I was given a researcher tag and read a list of rules. I could only take my file folder of information and a pencil in with me. No three ring binders, pens, laptops, cameras, briefcases, purses etc. were allowed. Free lockers are available. I entered the actual archives and was welcomed by a very friendly staff. I told them what I was looking for and they helped me find what I needed. I was looking for a will from Washtenaw county for a friend who lives in the Seattle area. They walked me through finding the microfiche needed to get the record number. There was some paper work to fill out requesting the record. They pulled the record for me. They deliver it to your table. I looked at it to make sure it was the right record and requested copies of it. They do all copying. The first 11 copies are free; and then it is $.20 a copy. You pay for the copies at the entrance where the check in is. Next, I wanted to find a naturalization record for Marquette county. Even though I had the volume and record number, I had to look up in a binder for more accurate information. The volume numbers on the microfilm are different from the volume number of the record. A staff member walked me through this and pulled the microfilm. I found the page, printed it and was done. A very easy process. I thought I would end my day at the Archives, but as it didn't take very long, only about 45 minutes, I decided to head back to the library. I spent another hour looking at railroad books, one specifically about the Duluth, South Shore and Atlantic railroad, which my great grandfather was an engineer for. All in all I had a very productive day. I found nine obituaries, six wedding/anniversaries and four other articles. I had six negative obituary searches. I found lots of other information from the books I looked in. I am so glad I took advantage of this wonderful genealogy resource right in my home state. If you are ever in the Lansing, Michigan area, stop and see the Library of Michigan and/or Archives. It is worth it. I am fortunate that all eight of my great grandparents settled in Michigan. Why has it taken me so long to go to the Library of Michigan then? It is only an hour from my house and pretty easy to get to. I don't really have an excuse, so I finally put it on the calendar and went. Before I went I took time to plan my visit. Admission is free to the library. They are open Monday through Friday from 10:00 a.m. to 5:00 p.m., except state holidays. Parking is available next to the museum with entrance to the circle drive on Kalamazoo Street. The cost is $1 an hour; maximum of $8. They only except cash at the present time. Food is available on the 1st floor or you may bring your own and eat in the snack shop eating area. No food or drink is allowed in the library. The Library of Michigan's Abrams Foundation Historical Collection is located on the 2nd floor. This collection is of particular interest to genealogists. Census records, cemetery transcriptions, city directories, county and family histories, newspapers, land records, vital records, military indexes, and more can be found here. ANSWER is the library card catalog. Using this before you visit the library will give you more time for research. I created a list of resources I wanted to check before I went. When I got to the library I looked at the books to the right and left of those I wanted, especially location specific ones. One of the great collections is the library's newspaper collection. They have newspapers from before Michigan became a state in 1837. 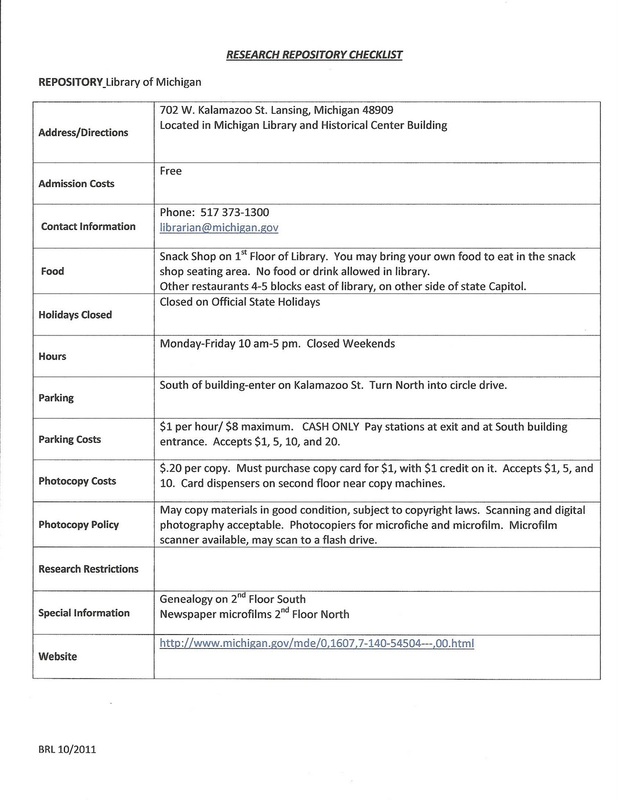 The microfilm newspaper collection has papers from all 83 Michigan counties. You can research what newspapers are available online. You can search by county or if you don't know the county you can search by the first letter of the cities name. I was excited to see they had the September 1950 Mining Journal from Marquette, Michigan. The library in Marquette didn't have the paper from that year. I enjoyed the one stop researching. Researching my ancestors from the Upper Peninsula to Southeast Michigan was done in one day and one place. Photocopying is available. A copy card is needed. You can purchase one for $1 and it is loaded with $1 credit. Copies cost $.20 each. The copy cards are used for microfilm copies too. Again, cash only is accepted. There is a microfilm scanner available which you may scan to a flash drive if you prefer. Your starting place for a visit to the Library of Michigan is at their website. Everything you need to know is on the website. If you need anything from the Archives of Michigan it is just a short walk from the Abrams Genealogy Collection. How great was a trip to the Library of Michigan? You will just have to wait for the next post when I tell more. Many of you have probably heard of the society's recent success with raising funds for the War of 1812 digitization project. Currently, they are working on a probate preservation project for Hendricks County, Indiana. Other projects IGS is involved in are listed on their website. IGS has a Facebook and blog presence. Both are very well done. I encourage you to take a look at the Indiana Genealogical Society. Check out their website, blog and Facebook page to see all the wonderful work they are doing with preserving Indiana genealogical records. "Michigan Marriages 1868-1925." Marriage Record. Family Search. https://www.familysearch.org/ : accessed 9 October 2011. 101 years ago today my great aunt, Jean Ethel Watt, married Arthur Roy Kellan. The above record of marriage cites this marriage. Hattie's Bible has been a great blessing to me. The family information has been great, but what is more special to me are the pictures. The above picture is of Hattie's mother-in-law, Adaline L. (Dyer) Glover, which I found in Hattie's Bible. Adaline L. Dyer was born 6 March 1838, in New York City, New York, United States. Her parents were William G. Dyer and Mary Ann Swallow. The Dyer family can be found living in Cazenovia, Madison, New York in the 1850 U.S. Federal Census. Adaline married Samuel Stillman Glover, Jr. on 2 August 1857 in Lenawee County, Michigan. She was 19 years old. Adaline and Samuel had ten children: Charles W., William E., Frank H. (my great grandfather), Mary J., Louis B., Laura J., Sarah, Twins Emma and Emerson, and Walter. Adaline died 19 December 1917 King, Waupaca, Wisconsin at the Wisconsin Veterans' Home. She is buried at Wisconsin Veterans Memorial Cemetery, King, Waupaca, Wisconsin. While I have discovered the vital records for Adaline, I would love to be able to flesh out Adaline with more facts or stories. I know very little about Adaline or her family. But, I think I know where I got my white hair from! Week 41: Teachers. Did you have a favorite teacher when you were growing up? What class(es) did this person teach and why did he/she make an impact on your life? He gave me my first E! I still remember the day as if it was yesterday. The class was 7th grade Science. It was a cool spring day, the last class of the day and the teacher was passing the test papers back. I turned mine over and saw an "E". I was mortified. I had never gotten an E before. I had studied, I had a good memory. How could I get an E? That teacher was Mr. Bishop and he became my all-time favorite teacher. He must have noticed my distress because he asked me to stay after class. He talked to me about the test and even explained some of the wrong answers I had gotten. I didn't say a whole lot. He then asked me if I had gotten an E before. I hung my head and said no. He said there was nothing wrong with getting an E, it was okay to fail every now and then. I think those were the best words I could have heard at that moment. They carried me threw other tough times in school and life. Mr. Bishop was an enthusiastic teacher, he had a ton of energy. He had a great sense of humor. He had high expectations for all his students. And, he created a fun, safe, and engaging classroom environment. Unfortunately, I only had Mr. Bishop for one class. He moved a couple of years after I had him for a teacher. I contacted Mr. Bishop when I was in high school and he helped me with some college decisions. At the time I wanted to study medical technology. He sent me some information about it. I appreciated that greatly. I started out in college with a medical technology degree, but decided eight semesters of chemistry wasn't for me! I became a teacher instead. Mr. Bishop influenced me as a teacher, too. I remembered what I liked about his classroom and tried to emulate it in mine. I kept a sense of humor and had high expectations for all students. But, most of all I remembered and shared with my students that it is okay to fail. Harry is the son of Frank H. Glover and Hattie Fenn Glover. This marriage is also recorded in Hattie's Bible, which is in my possession. Emma Winkler is the daughter of John Winkler and Johanna Lindner. The 2 October 1911 marriage took place in Marquette, Michigan. The Rev. W. Roepke officiated. Witnesses were Herman Schumaker, a friend of the Glover's and Emma Winkler's nephew, and Mrs. W. Roepke.